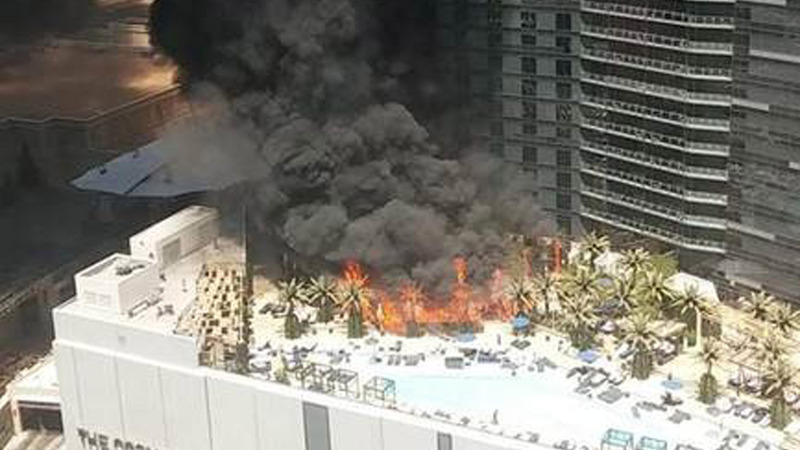 LAS VEGAS (KGO) -- A fire at a hotel swimming pool that sent large plumes of black smoke high above the Las Vegas Strip appears to be under control. Person told me fire at Bamboo pool at #cosmopolitanhotel appeared to start in kitchen. Palm trees then caught on fire. Officials say one person has been transported to a hospital, but they did not say why. Baker says the fire started at an outside pool area, setting pool cabanas and trees ablaze. The cause of the fire has not been determined. Emergency vehicles were called to the resort shortly after noon.